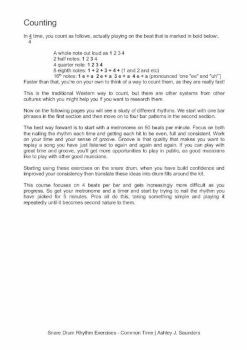 If you are looking to take your drumming to the next level, then first you have to sort out the fundamentals of your playing. This ebook will help you to develop your timekeeping skills and is a must-have reference for every drummer. 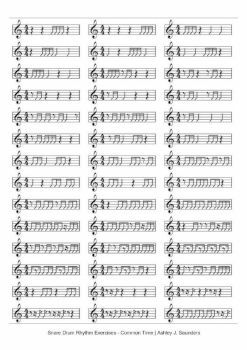 In order to become a good musician, you have to have a solid foundation. Quite simply as a drummer if you can't hold a tempo and play with feel then it's unlikely that your phone will be ringing. Therefore if you want to play with other great musicians and be gigging often, then you need to sort out your timing. 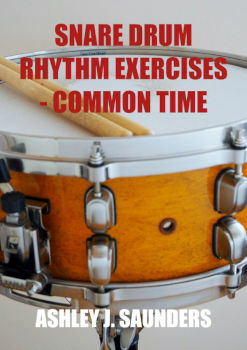 While Snare Drum Rhythm Exercises in Common Time eBook is a reference book, it does contain 200+ rhythm patterns and ideas. 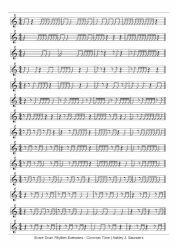 All of which when practised at varying speeds with a metronome will enable you to fine-tune your inner metronome and make you easy to play with. It's best to start on the snare drum and build confidence, then move the exercises around the drum set. This eBook is divided into two sections. The first section covers one bar phrases. Whereas the second section is based around 4 bar phrases. As this ebook does get progressively harder and even the most advanced player will be challenged by this ebook. As a drummer you need to have solid timekeeping skills and this eBook will enable you to start developing these skills.